The Open Access (OA) movement is about barrier free, online access to scholarly literature for readers. Rather than locking away scholarship and providing access only to paying institutions, it is about free access to research for everyone. Short one page introduction to the vocabulary or Open Access, by Peter Suber. 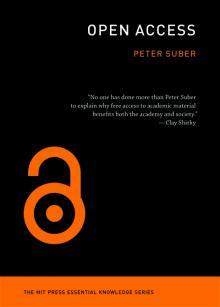 An open access book written by Peter Suber and published by MIT Press in 2012. It is a great resource on Open Access. The Open Society Institute passed the Budapest Open Access Initiative, a declaration about the rights of open access. A short handout about ways that faculty can promote Open Access on their Campuses. Booklet that contains helpful information for authors wanting to keep copyright rights.